If you follow me on Instagram, you’ll already have seen the first look thanks to a partnership I had with MakeSpace (see it here – they helped me clear out clutter to make room to redecorate). I wanted to make it official on the blog today, and I also plan on creating a video later when I get some makeup organizer trays (yay!). Plus, I wanted to talk more in depth about my process because it took me a while to settle on the look and style of the setup. It also doesn’t help that I love so many different things and am slightly indecisive. Ultimately, I’m so happy with what I chose — plus, good things take time. 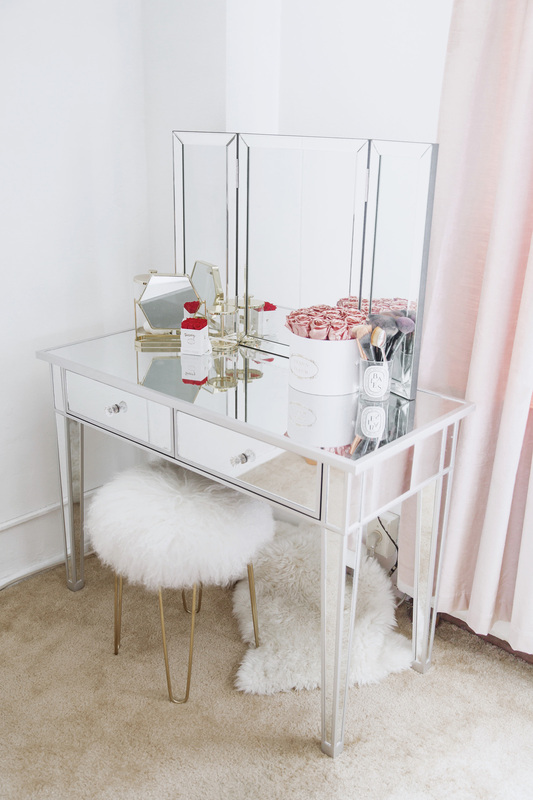 I knew I wanted mirrored furniture because I love the vintage glam factor. Since I didn’t completely love the full sets in the market, I went ahead to find all the components separately to build the one of my dreams. This way, I know I will love the look and size of everything. My only concern would be making sure the entire look came together coherently. I love working with details, so this is truly a labor of love. 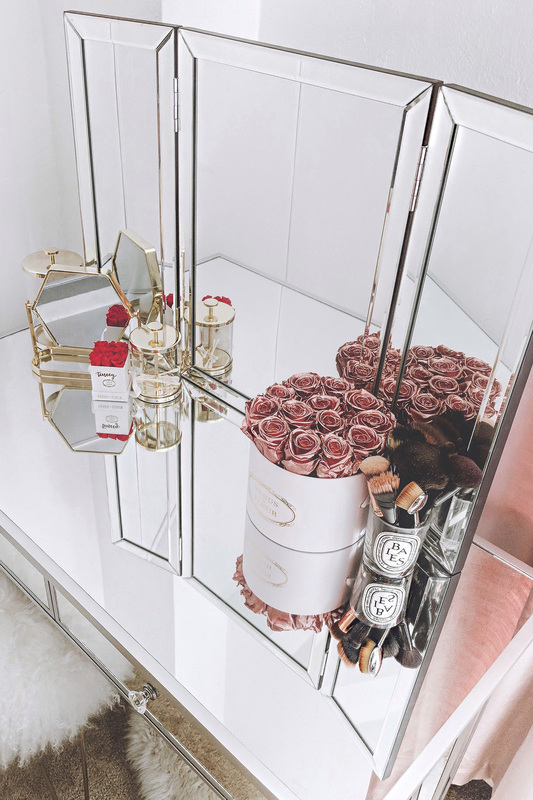 The Mirror – I started with the tri-fold mirror because I was the pickiest with the style I wanted. There was a lot of options out there, mostly where the outer thirds were shorter than the main middle mirror. I love that vintage look, but I wanted the overall feel to be a little more modern, so searched for one with equal height through the three panels. The Table – I stumbled upon this lovely console table on Amazon (love that site for everything) during my research. It check off all the boxes for me and is quite affordable. My favorite part is the crystal style knobs! It also helps that it has 1000+ great reviews — many as a makeup vanity as well. The Chair – It was honestly between a fluffy stool or a velvet accent chair. As much as I love velvet chairs, I wanted to keep it simple and streamlined. After going through several options, this one fit the right color (almost got pink) and height. I wanted to make sure the chair had gold legs to go with the accessories I plan on adding to the table. I LOVED the west elm version, but this one had it beat on price. Speaking of which, I found some really great gold hardware vanity add-ons from the Nate Berkus collection at Target. It really helps bring a touch of vintage glam to the overall modernized look. I’ll get more into organization and storage in a future post! There you have it! Thanks for reading about my newest update on the interiors front. I’m now hooked and can’t wait to keep working on all the different corners of my home. Stay tuned.